Very beautiful lady's watch! Wish I could have kept it. However, it was on the heavy side for me to wear comfortably. I am 68 years old and prefer something that is light weight. I returned it for this reason. 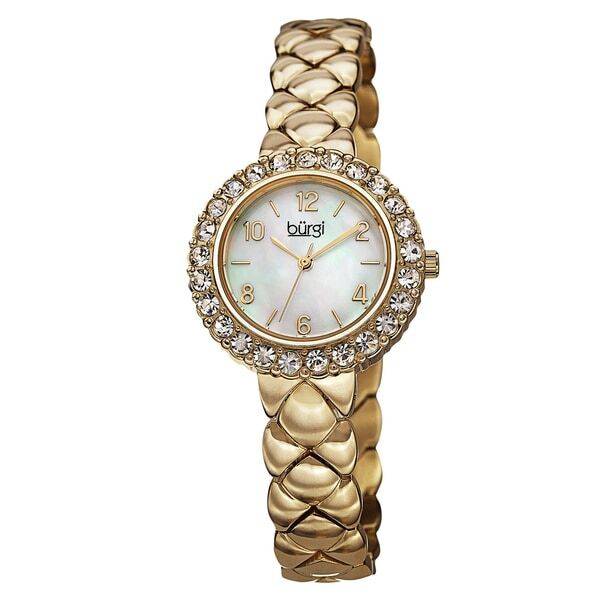 This Burgi women's watch has a stainless steel bracelet and is powered by Swiss quartz movement. It features sparkling Swarovski crystals on the bezel and a beautiful mother of pearl dial. The classy and chic look of this watch will surely compliment any attire. I like sparkly jewelry and this watch is one-of-a-kind. The stones are not overwhelming but shiny. I'm tempted to buy another just in-case something every happens to this one. I would be happy wearing this for the rest of my life. Make sure you read and understand measurements before purchasing. I was looking at another Burgi watch too, but that would have been too large on my wrist. This was very easy for my husband to remove 3 links. This is a pretty watch, when set it kept time. I've just set it so, further info might follow this review. I have very small wrists and will need a jeweler to remove several links. I hope it will prove to be as reliable as the watch I bought for my son on O. I wanted a pretty gold watch and this fits the bill. I love the crystals and the design is very pretty. This is not a well made watch. crystals are very big and cheep looking. The band is stiff around the case and large so for sure for average built ladies it needs to be resized. I tried to keep it but after one day looking at it I was convinced that I would not be able to wear this watch neither during the day nor for evening events.. so I returned it. Just received the watch. It is beautiful, love it. Know that it will be warned frequently. Thank you for having quality, good price and the elegance that I was looking for, and now have. Beautiful watch. Bigger than expected. Love!! The watch is really elegant but my didn't work. I had to return and going to replace it. Overstock had a large section of watches. I love watches. Will definitely buy more soon. I bought this watch as a gift for my niece and when she received it she was pleasantly surprised. She called me the minute she got it and told me it was gorgeous. Thanks for the perfect gift at a perfect price. Very poor service. I ordered this watch for a gift and with an estimated delivery one week later (12/4) and I have not received it to date (12/10). I was told by customer service that the estimated date given is not really the date. Overstock does not know the estimated date until it is shipped, which I still do not know. I have cancelled my O-Membership auto-renewal. Ridiculous!!! This is for someone who likes the classic, feminine look - not the larger boyfriend watches.